US President Barack Obama has called on the National Security Agency to halt spying on the headquarters of the International Monetary Fund and World Bank in conjunction with a review of surveillance activities, Reuters reported. A US official told the news agency that President Obama curbed the spying within the last few weeks, around the same time he told the NSA to stop eavesdropping on the United Nations headquarters. 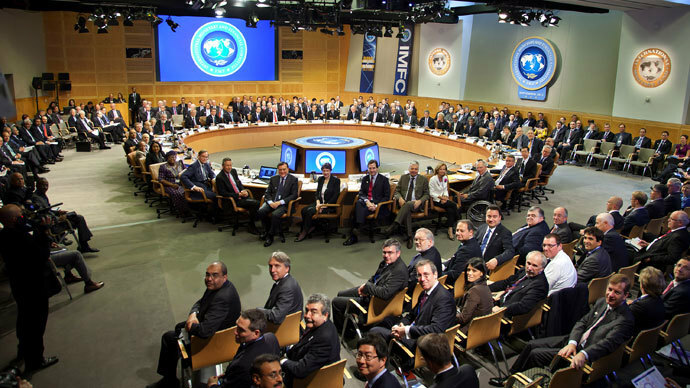 The NSA’s surveillance of the International Monetary Fund and World Bank in Washington was previously unknown based on the classified nature of such programs. Responding to Reuters, a top Obama administration official said, "the United States is not conducting electronic surveillance targeting the headquarters of the World Bank or IMF in Washington." However, the official would not say whether the NSA had spied on the entities in the past. The IMF and World Bank would not comment, nor would spokespersons from the NSA or the Office of the Director of National Intelligence. Top officials with US intelligence agencies have admitted economic espionage in the past, but a former senior US intelligence official said the Obama administration has put more effort than previous administrations into gathering economic data. Upon entering the White House, Obama began receiving a new “Economic Intelligence Brief” from the Central Intelligence Agency, in addition to regular updates of international security assessments via the President’s Daily Brief. The supposed reason for the change at the time - according to Leon Panetta, Obama’s first CIA director - was to understand activity surrounding the global economic crisis. The move to curtail spying on the economic organizations followed steady revelations that began in June - supplied by former NSA contractor Edward Snowden - of NSA surveillance programs targeting foreign governments and institutions, as well as international and domestic citizens. Obama also in the past few weeks ordered the NSA to stop tapping the UN headquarters in New York amid the review of electronic surveillance programs, Reuters reported Wednesday, again citing official sources. “The United States is not conducting electronic surveillance targeting the United Nations headquarters in New York,” a senior Obama administration official told Reuters. Sources would not say whether Washington is continuing to monitor UN diplomats elsewhere in the world. RW - So all the spying on the real enemies of the US of A is to be curtailed while data gathering and spying on the American people continues. I'm sure no one will notice how transparent Obama is in all this. From here on in the secrets of the Federal Reserve and it's sub agencies will no longer be threatened by any whistleblowers in the NSA, not that there was ever any danger of that happening. They can continue to loot America and now never be noticed... what a fawking joke. NSA spying on the World Bank & IMF, now that I can support! Exactly! How did the outcry against spying on the people turn into some faux concern for spying on institutions plotting to rob the people?